Laurel Ridge is a charming 2 bedroom cabin with space for up to 6 guests. Offering wonderful views, particularly in the winter months, this great property is just minutes away from all of the fun in downtown Pigeon Forge. Guests at Laurel Ridge will never be bored, with a pool table, electronic dartboard, and WiFi at their fingertips. Almost Paradise is about as close to heaven as you can get! Families will love relaxing at this 2 bedroom cabin that sleeps 4. Located 2 miles from the Pigeon Forge Parkway, Almost Paradise is close to all of the area’s best attractions but still tucked away from the hustle and bustle of downtown. Perfect for a family reunion or another group get together, Bears in the Sky is a 4 bedroom cabin with space for 15 people. This cabin offers endless entertainment, including an Xbox 360, surround sound system, billiards, electronic dartboard, air hockey, big screen TV, Blu-ray player, multicade arcade system, and WiFi. 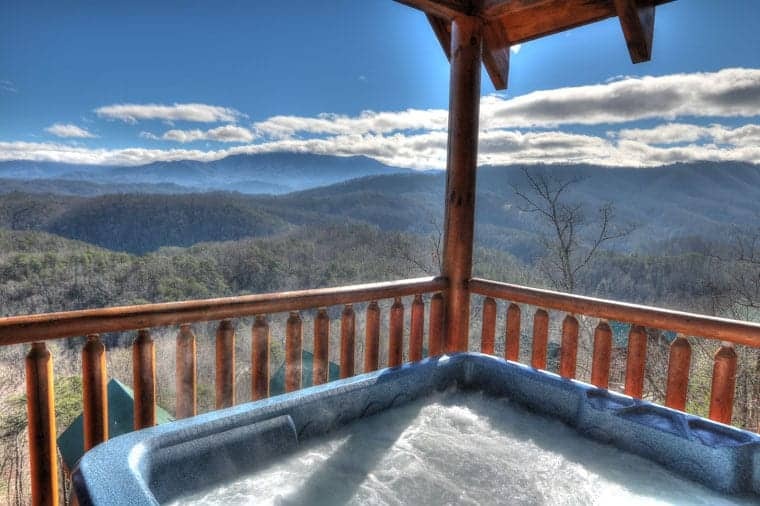 It’s easy to see why Bears in the Sky is one of our most requested cabins with mountain views in Pigeon Forge! You’ll be fantasizing about Catching Dreams long after your vacation! This 1 bedroom cabin with space for 4 is located in the scenic Wears Valley area. If you’re after peace and quiet, you will love Catching Dreams. Soaking in the hot tub or kicking back in one of the rocking chairs on the deck will have you feeling relaxed and refreshed in no time. Changes in Latitude is a 2 bedroom cabin that sleeps 6 guests. Located 3 miles from downtown Pigeon Forge, this cabin offers some of the very best mountain views in the area. Changes in Latitude truly has it all, offering a gas grill, Jacuzzi, Blu-ray player, electric fireplace, pool table, Playstation 2, and so much more. Whether you’re looking to sleep like a bear or have an active vacation, Hibernation Station is a great choice! This 1 bedroom log can with space for 4 is located in a resort community that is only 5 miles from the heart of Pigeon Forge. Offering a picnic table, patio chairs, and a hot tub, this cabin’s covered partial wraparound deck is absolutely delightful. Ideal for a couple’s getaway or a family vacation, Alpine Lovers Penthouse is a two level cabin with a Queen bedroom and a lofted King bedroom. Highlights of this beautiful cabin include a pool table, Jacuzzi tub, charcoal grill, gas fireplace, swimming pool access, and internet access. To learn more about these awesome cabins with mountain views in Pigeon Forge, or to get a cabin recommendation, don’t hesitate to give our friendly staff a call today!